We've built it! Now you can play Letterlicious on your iPad, iTouch or iPhone. As well as the Daily Competition Puzzle you can play any number of solo games or play with a friend in Two Player mode. App Price: $2.99 This icon will take you to the Apple Store within your iTunes program. You need iTunes to download this game for your iPhone or iTouch. 1) Daily Competition puzzle - play the same puzzle on the app as if you were on the website - but with better graphics! You use the same account you registered with on letterlicious.com. You can create an account on the App and thi synchronises with your details on on the website. 2) Random puzzle generator for Solo games - play as many as you like to improve your skills. We have also introduced a Two Player version of Letterlicious. Using the same iPad take turns with your friend to get the highest score. 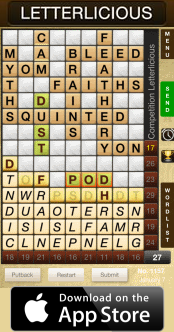 Bonus point are awarded for longer words but the tricky play is getting all the letters in rows and columns before your partner does as these score big. You can also pinch your partners words by making them longer. 5) Support for iPad, Retina iPad, iPhone 4 and less (3.5" screen) and iPhone 5 (4" screen). We have tested under iOS 5, 6 and iOS 7. Any features you'd like to see? We've been developing this app for over a year, on and off, and really like it. We'd like it to be a success and draw more people into the game, and heat up the competition. We're very responsive and grateful to everyone's ideas and comments, so please don't be shy if you have a suggestion. Write to me at andrew@str8ts.com. We are working on a Game Center mode which will allow two devices to play Two Player mode - whereever they are in the world. App Help Page that is inside the app. This page was last modified on 18-January-2014, at 09:46.